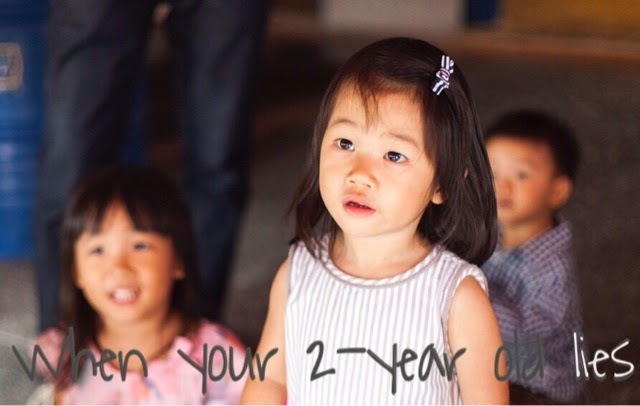 mummywee: Discipline #8: What do you do when your 2-year old lies? Discipline #8: What do you do when your 2-year old lies? I was caught off guard when Kate's teacher informed me that she had told a lie. I have to admit that in my earlier years of parenting, when faced with such an awkward situation, I would have either fumbled for a reply, made some excuses or doubted the teacher. My kid? No way! There must have been some mistake. Instead, I remained calm and wanted to know the whole story so that I could figure out how to deal with it. This was how it went. Kate had taken a new activity to play with, and her Chinese teacher asked if she had been taught how to work with it. Kate immediately replied, "Yes." Her Chinese teacher knew it was not the case and asked who had demonstrated it to her. Kate responded, "Ms Sha", without batting an eyelid. Ms Sha overheard the conversation and walked over. Kate knew her lie had been exposed and looked down, afraid to look into Ms Sha's eyes. Her teachers took the opportunity to teach her that lying is wrong. The thing was, we were shocked that a 2.5 year old knows how to lie so blatantly! On the way home, I reiterated that it was wrong of her to lie. However, I knew deep down in my heart that the problem lies with us, not her. After all, little kids imitate and absorb what they see and hear. At dinner, I told the rest of the family what had transpired that day. The kids were old enough to point out that "adults also tell white lies, even you and daddy, so that must have been where she picked it up from". They recounted many instances where the truth was not spoken. Dad tells whoever we are meeting that "We are almost there" when we had just left the house. I heard Uncle T say that last week too. Aunt J always promise us that she's coming to visit soon. But she never does. You said you'll be back in 15 minutes. You lied. With 5 "witnesses" to our daily behavior, the examples came fast and furious. I had nothing so say. The kids were right. The next day, I was on high alert to what I was saying and what others around me were saying to Kate. The girls were eating sweets and when Kate asked for some, they replied, "No more." I went home and found #5 quietly giving Kate his snacks (which are too salty for her) and when I boomed, "Why are you giving her the pretzels? ", he said, "Just a few.". I'm sure she had way more than a few. There were countless instances where words came out of my mouth before I realised they were not the absolute truth. I noticed a pattern here. We instinctively try to shade the truth to avoid her whining or crying, so that we don't have to deal with it. Unknowingly, we taught her to lie. I've decided that I'll start focusing on improving one parenting skill at a time until I conquer it. Then I'll work on the next one. Here are some good tips on how to help your child deal with lying, over at Life's Tiny Miracles blog. Tip #6: Ban books? What are you gonna do about phones? Thanks for the reminder. "Kids imitate." Now, I know where went wrong with my sons. Is only true others we see ourselves. Thanks for sharing! Yes, there's this saying that we don't have to worry that our kids are not Listening to us. We should instead worry that they are Watching (and imitating) us All the time!